Decide where on your property you’ll build your new shed (consider prevailing winds, convenience to home, etc) & check that the shed will fit in the space available. If the site is out of level by a large amount, is there another location you could use to avoid expensive earthmoving costs? Seek information and advice from a reputable shed company. Ask for referrals from the shed supplier and view a shed they have built in your district. Ask how long to delivery/erection and how this time frame is managed and maintained. Does the shed company supplying the shed organise builders and remain responsible for the workmanship of the builders? 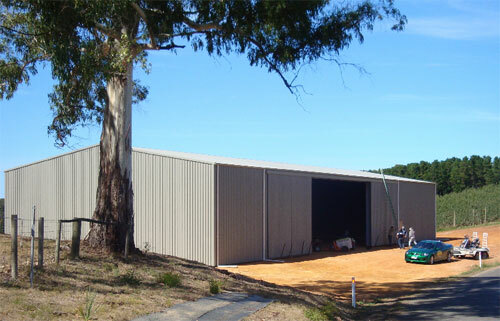 Choose from well established shed companies that actually operate in SA. Interstate companies that claim to have premises and staff in SA: They may actually be giving the address of the SA branch of their steel supplier only. There may be conflict about who holds responsibility on short-supplied items. Will all necessary components be supplied? If not, who do you need to contact and will they assist? Some companies won’t help if you don’t report shortages on delivery, but most often you won’t realise the shortages until the shed is being built. Is the company located in SA and do they know SA Council building rules? Be careful with shed companies that won’t build your shed for you. Get building quotes from builders before buying your shed as you may find your local shed builder charges much more for shed brands he doesn’t know or that he’s had problems building in the past. Having to arrange your own shed builders will add enormously to your time commitments. You’ll need to chase them up to ensure they don’t cause lengthy delays to your building time. Find experts in the shed industry – a shed company with experience and a great reputation. Use a shed company who will support you, follow-up and make sure you’re happy. A shed company who organises shed building for you. Shed builders with extensive experience and great pride in their workmanship. Or, if you want to build it yourself or use your own local builder, check if the shed will be easy to build. WARNING: Do Not Buy Your New Shed Until You Read This: The Official Smart Guide To Choosing The Best Shed For Your Property. To Get Your FREE copy, click here.